As I mentioned in my last post, I am not what you would call a precision quilter. That is, I haven't as yet acquired the skill set for doing lots of intricate piecing together of lots of small fabric shapes. You need not only the workmanship skills to do this, but also the patience. It's slow going. And then, you get bitten by the fussy cutting bug. Fussy cutting is when you choose a particular part of your fabric because you want, for example, that cute bunny to appear in the middle of the block you are working on. Fussy cutting usually means being wasteful with fabric, because you forget about cutting from the edge of your yard of fabric, and you cut right into the middle. Yep, right into the middle of that darn piece, because I just had to have that specific square. Isn't that shameful? And fussy cutting doesn't just consume fabric, it consumes time like nobody's business. 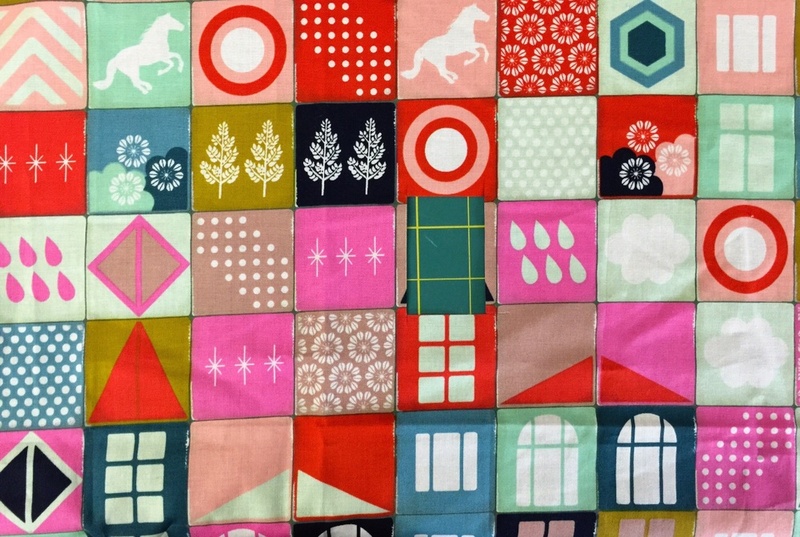 Exactly how long can a person stare at different fabrics determining which two inch square is the best for the layout? A lot of time. But eventually, several hours later, I did finish my Elevator block for the Patchwork City BOM. I'm quite pleased with the layout, and you will kindly not point out the wonky bits. There are several. Of the nine fabrics used above, five came from the Intrepid Thread selection, and four are from my stash. I think it's good that this Patchwork City project is going to be two blocks a month over the course of the year, I think doing this kind of work might make me crazy in bigger doses. It will make a good diversion each month, and who knows, I might even get better at it.